I wish I had the chance to take a hand quilting class, too. 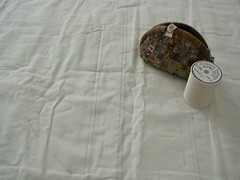 I really want to learn skills like quilting in different directions. Have fun with your homework! It is really worth all the effort! If you do get the chance, I'd advize you to take it! Before I thought quilting was tedious, now I really see how it can finish your quilt beautifully, and how it is a wonderful art to learn!